For a true taste of the outdoors, camping on Tasmania’s east coast is a must-do experience. Whether your taste is back to nature or outdoor luxury, you’ll find your ideal camping holiday on the Great Eastern Drive—from guided bushwalking tours to holiday parks, cabins and free camping. 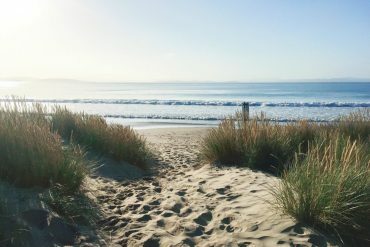 The east coast of Tasmania has some of the best camping locations you’ll find anywhere—including some of the world’s most beautiful beaches at Freycinet National Park and the Bay of Fires, and the World-Heritage listed Darlington probation station at Maria Island. Camping opens the door to experiences you’ll never forget—think close encounters with wildlife, a bottle of fine Tasmanian pinot by the campfire, and a sky so full of stars you won’t want to go to sleep. Camping areas for tents, campervans and camper trailers are dotted all along the coast (most with superb views). 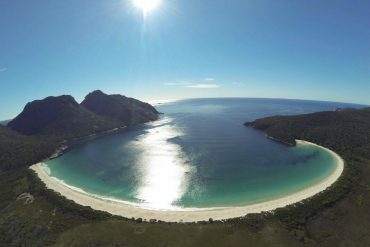 You’ll also find campsites in the east coast’s four national parks—Freycinet, Maria Island, Douglas Apsley and Mt William. Some of the Great Eastern Drive’s best known guided walks combine accommodation in standing camps with luxury eco-lodge accommodation. For more glamorous camping, book your place on the award winning Maria Island Walk, Bay of Fires Walk or Freycinet Experience Walk. To plan your Great Eastern Drive camping holiday, check the East Coast Tasmania Camping and Holiday Park Guide, which lists the best locations along the coast for camping, including facilities, camping fees and access. You can download it here. Depending on your schedule, you can camp for a single night or for the duration of your trip. Guided walks such as Freycinet Experience, Bay of Fires Walk and Maria Island Walk combine camping with lodge accommodation over three nights, and Wineglass Bay Sail Walk combines bushwalking, sailing and accommodation aboard the Lady Eugenie on four or six day itineraries.